Establish the identity of the gas, and understand the properties of the gas by consulting the material safetY data sheet (DASDS). Determine the correct equipment to be used and how to safely operate such equipment. Ensure that only trained personnel should handle gas cylinders. 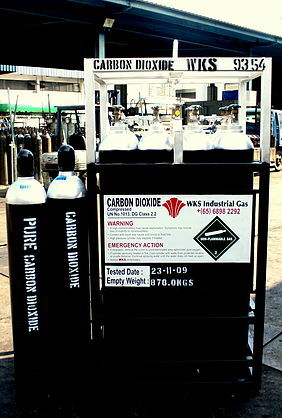 Provide and don appropriate personal protective equipment (PPE) prior to handling gas cylinders. Ensure other safety equipment such as fire extinguishers, wash stations etc. are at appropriate locations. Do not remove or deface any labels or stenciled marks provided by the supplier. 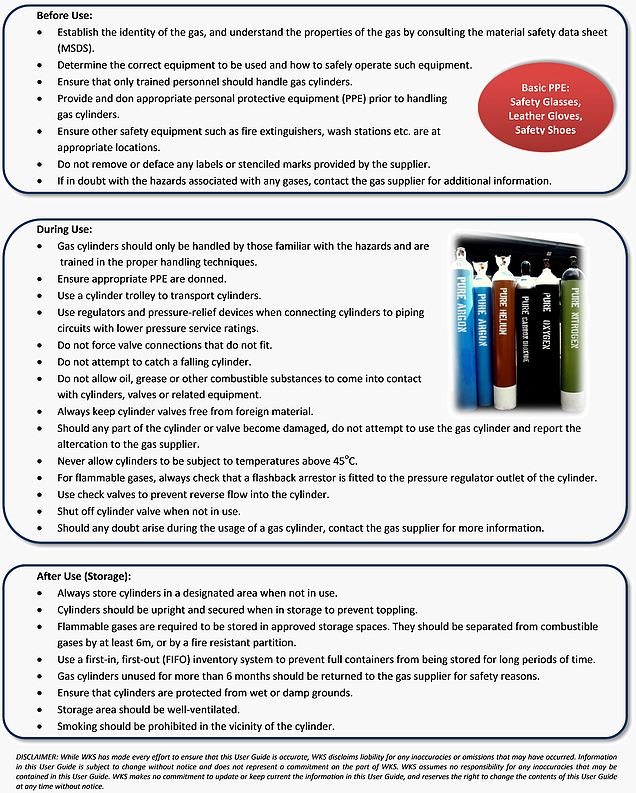 If in doubt with the hazards associated with any gases, contact the gas supplier for additional information. 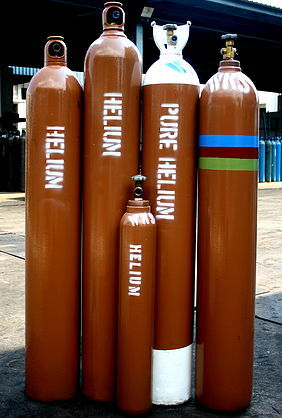 Gas cylinders should only be handled by those familiar with the hazards and are trained in the proper handling techniques. Ensure appropriate PPE are donned. 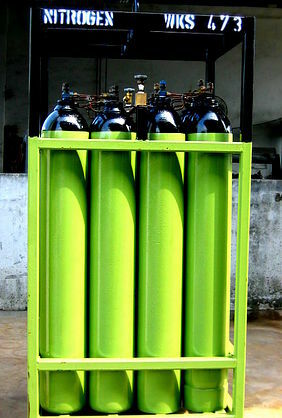 Use a cylinder trolley to transport cylinders. Use regulators and pressure-relief devices when connecting cylinders to piping circuits with lower pressure service ratings. Do not force valve connections that do not fit. Do not attempt to catch a falling cylinder. Do not allow oil, grease or other combustible substances to come into contact with cylinders, valves or related equipment. Always keep cylinder valves free from foreign material. Should any part of the cylinder or valve become damaged, do not attempt to use the gas cylinder and report the altercation to the gas supplier. Never allow cylinders to be subject to temperatures above 45°C. For flammable gases, always check that a flashback arrestor is fitted to the pressure regulator outlet of the cylinder. Use check valves to prevent reverse flow into the cylinder. Shut off cylinder valve when not in use. 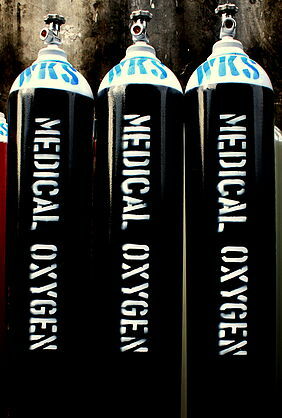 Should any doubt arise during the usage of a gas cylinder, contact the gas supplier for more information. 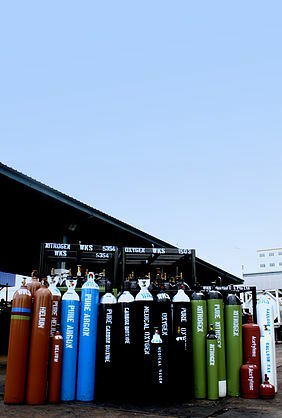 Always store cylinders in a designated area when not in use. Cylinders should be upright and secured when in storage to prevent toppling. 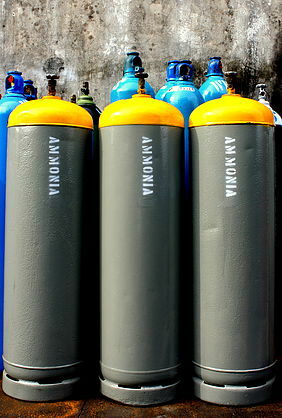 Flamrnable gases are required to be stored in approved storage spaces. They should be separated from combustible gases by at least 6rn, or by a fire resistant partition. Use a first-in, first-out (FIFO) inventory system to prevent full containers from being stored for long periods of time. 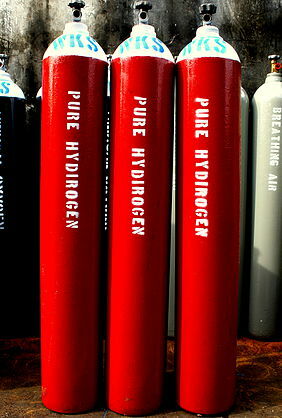 Gas cylinders unused for more than 6 months should be returned to the gas supplier for safety reasons. Ensure that cylinders are protected from wet or damp grounds. Storage area should be well-ventilated. Smoking should be prohibited in the vicinity of the cylinder.